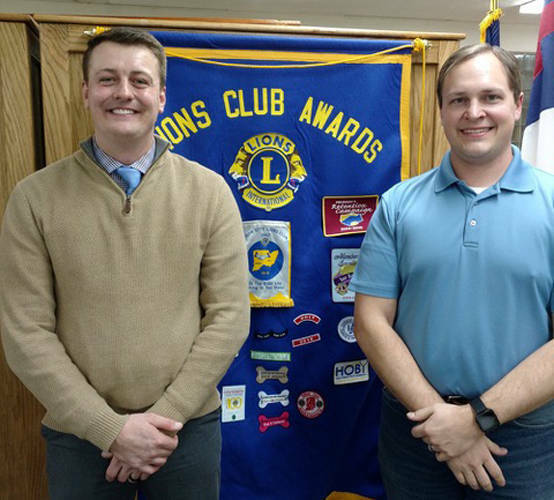 North Side Elementary Assistant Principal Andy Stover and Lion Blake Clevenger are pictured at the Union City Lions Club’s meeting on Tuesday. UNION CITY, Ind. – The Union City Lions Club had its second meeting for the month of January on Tuesday. The club enjoyed the meal prepared by D’s Restaurant of Salisbury steak, mashed potatoes and gravy, green beans, and mixed fruit. The program for the evening was North Side Elementary Assistant Principal Andy Stover. He spoke about the character education program going on at the elementary school in Union City called, Leader in Me. North Side was involved last year with a study of the book “7 Habits of Highly Successful People” by Sean Covey. The staff and students studied the seven habits through the school year last year. This year they have taken the next step and are involved in the Leader in Me program. The Leader in Me uses the information from the “7 Habits of Highly Successful People” book and teaches kids about good character traits. Stover emphasized how important character education is for students in this day and age.